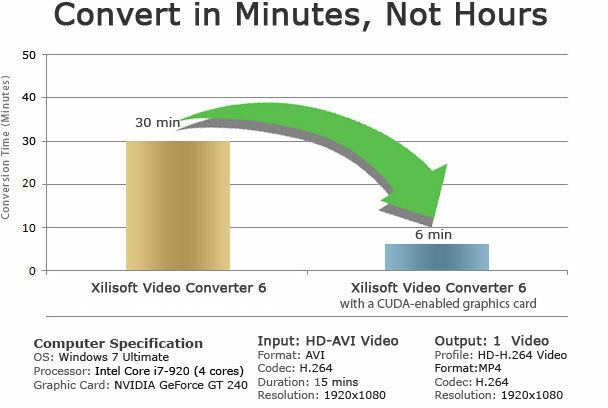 For a better video conversion experience, Xilisoft's products have been upgraded with NVIDIA CUDA technology and ATI Steam technology offering improved video encoding/decoding performance (when processing high-definition videos in particular) for any computer running on CUDA-enabled GPU or ATI Stream-enabled GPU. By processing video conversions on NVIDIA's GPU/ATI Stream instead of your computer's CPU, more CPU resources can be spared for other applications, making your computer run 5 time faster. Conversion profiles that leverage CUDA technology/ATI Stream technology are clearly labeled; users can optionally enable GPU encoding/decoding acceleration once CUDA-enable graphics card/AMD graphics card with ATI Stream technology has been detected. The diagram below shows the improvement in performance when converting with and without CUDA/ATI Stream. The results are given in mins. Convert video, music and other multimedia files for your iPad in high quality audio and video format.